Forecast average electricity price over 20 years: 28p to 56p? The cost of battery storage has come down significantly in recent months. The lifetime cost of small scale battery storage is now around 10p per kWh. This is the cost ‘per cycle’ of charging and discharging 1 kWh (excluding the cost of the electricity used to charge the battery). Battery storage for solar - storing electricity produced by solar and other renewables on site, rather than exporting it to the grid for no additional income. At the moment the amount paid to owners of residential solar systems in respect of electricity exported to the grid is a ‘deemed’ amount, not a ‘metered’ amount. In other words the owner doesn’t get paid any more or less in Export Tariff however much they export to the grid. It therefore makes sense to use as much solar generation on site as possible. With domestic electricity market prices hovering around 15p per kWh, then, after taking into account efficiency losses (~11% round-trip), each stored solar kWh is worth around 13.35p. The ‘profit’once the cost of storage is taken into account is about 3p per kWh. Put another way, storing 1 kWh of on-site solar generation every day for 300 days of the year is worth about £40. 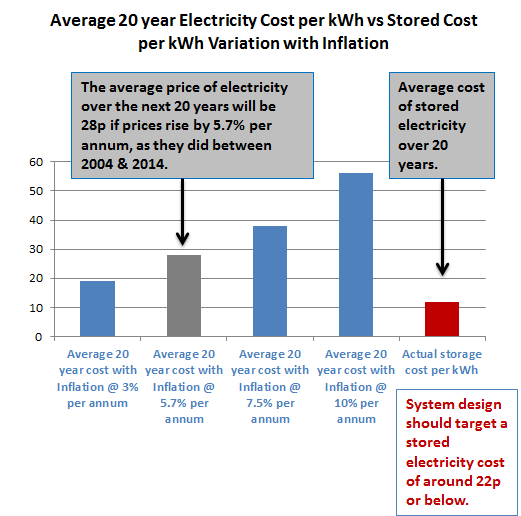 At the moment the cost per kWh of storage (all-in installed cost) is about £520, and so the payback time for a system is around 13 years. This doesn’t take into account the fact that the cost of electricity is expected to rise. With an expected cost per kWh of 20p plus over the next 10 years, storing 1 kWh every day for 300 days of the year will on average be worth about £60, thus reducing the payback time to under 9 years. Note that the battery must be tightly sized to ensure that it is utilized as fully as possible. We have systems to calculate the optimal sizing of the system. Time of use optimization – buy cheap, use peak! With the advent of smart metering, ‘Time of Use tariffs’ are coming into their own. The traditional Economy 7 tariff has now been extended to full “Time of Day” tariff differentiation (requiring a Smart Meter). 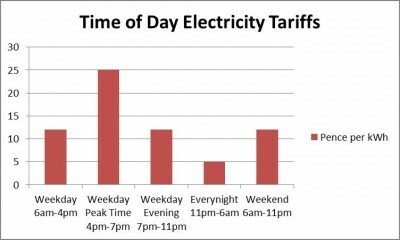 For a consumer on a flat 15p per kWh tariff, there is an opportunity to save around 10p per kWh (compared to their current tariff) by ‘buying cheap’ at night and ‘using peak’ in the day. After efficiency losses, the true saving will be 8.9p per kWh. Each kWh of battery will allow a saving of around £33 per annum. Overall the savings again work out at about £40 per kWh of storage per annum, and the pay-back time is again around 13 years on a 20 year investment. Again that’s before the anticipated rise in electricity prices is factored in as we all start to drive electric cars…. With daily cycling, lithium ion and aqueous hybrid (salt water) batteries should last around 10-20 years. For lead acid batteries, the expected life is more like 5 to 6 years, although the system life can be assumed to be 10 to 12 years, if the economic model allows for one replacement of the battery. The table below sets out typical lifetime costs of electricity for different system sizes and different types of battery. Overall the real cost per kWh of energy discharged by a battery storage system is approximately 15p to 30p per kWh for most systems, with lithium-ion coming out strongly on top due to its long life. If electricity prices keep rising at this rate, then in 20 years’ time, the real cost of electricity will be 42p per kWh. The average cost over the next 20 years will be 28p per kWh. If electricity prices rise by 7.5% per annum in real terms, the average cost over the next 20 years will be 38p per kWh. 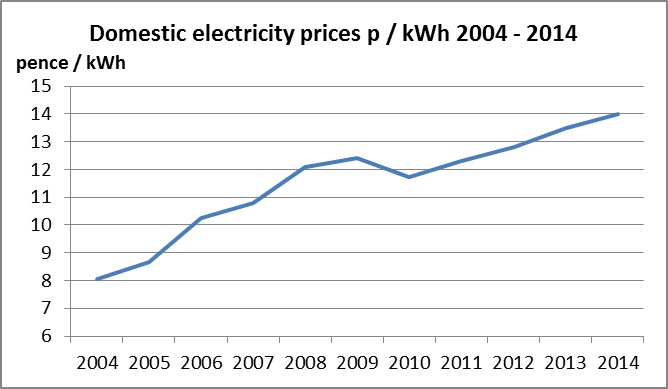 If electricity prices rise by 10% per annum in real terms, the average cost over the next 20 years will be 56p per kWh. So with electricity price inflation at 7% to 10% per annum, systems achieving a stored energy cost of around 10p to 25p are starting to look like a reasonable investment, particularly when the other potential benefits of on site storage are taken into account. And as the cost of storage comes down, the economic case will strengthen.